The Vitruvian Man is a drawing made by Leonardo da Vinci in about 1490. Around the drawing are notes based on the work of the architect Vitruvius. The drawing is done in pen and ink on paper. It is of a male figure standing in two positions, that are superimposed (drawn over the top of each other). The figure's arms and legs are drawn in two different positions, while the rest of the body stays in one position. The figure is drawn standing inside both a circle and a square. The drawing and text are sometimes called the Canon of Proportions or, less often, Proportions of Man. It is stored in the Gallerie dell'Accademia in Venice, Italy. It is displayed only occasionally. 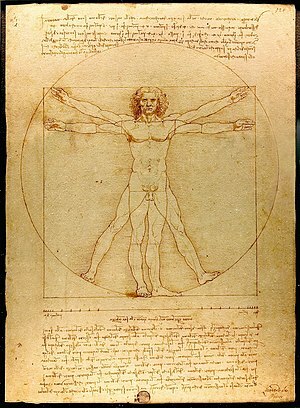 The drawing is based on the ideal proportions of a man's body, and how this relates to geometry. This relationship was described by the ancient Roman architect Vitruvius in Book III of his treatise De architectura. Vitruvius wrote the human figure was the main source of proportion among the Classical orders of architecture. He wrote that the ideal body should be eight heads tall. Da Vinci's drawing is traditionally named in honour of the architect. ↑ "The Vitruvian man". Stanford University. Retrieved 20 August 2010. ↑ "Da Vinci's Code". Witcombe.sbc.edu. Retrieved 20 August 2010. The Simple English Wiktionary has a definition for: Vitruvian Man. Wikimedia Commons has media related to Vitruvian Man by Leonardo da Vinci. This page was last changed on 27 April 2018, at 07:39.